Adrian (aka One-Zero-One) is a real life doctor who dresses as a Vault Doctor in his down time. 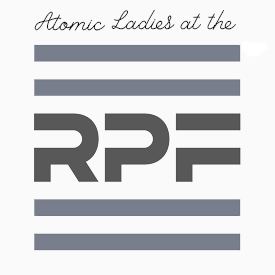 Adrian is the electronics and chemistry specialist of the group, creating our Pip-Boy 3000s and tinkering with many Nuka-Cola Quantum recipes. Missed out on getting your very own Pip Boy 3000 when you turned 10 years old? Don’t worry, there’s no need to get all mopey like Paul Hannon Jr. 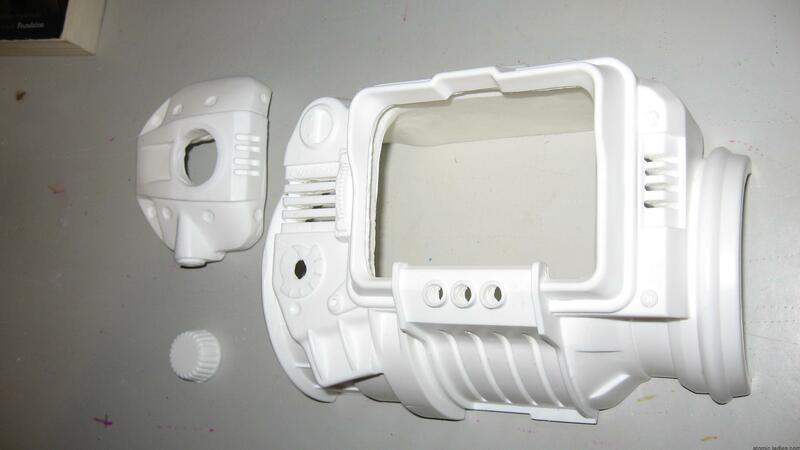 In this post I show how I made a wearable and functional Pip Boy 3000 replica prop from the Pip Boy resin cast produced by Skruffy Studios. Unfortunately it won’t dispense a combat shotgun at the push of a button, but it does have the light and sound effects of the Pip Boy in Fallout 3 and New Vegas, and it plays “Butcher Pete” from your wrist. 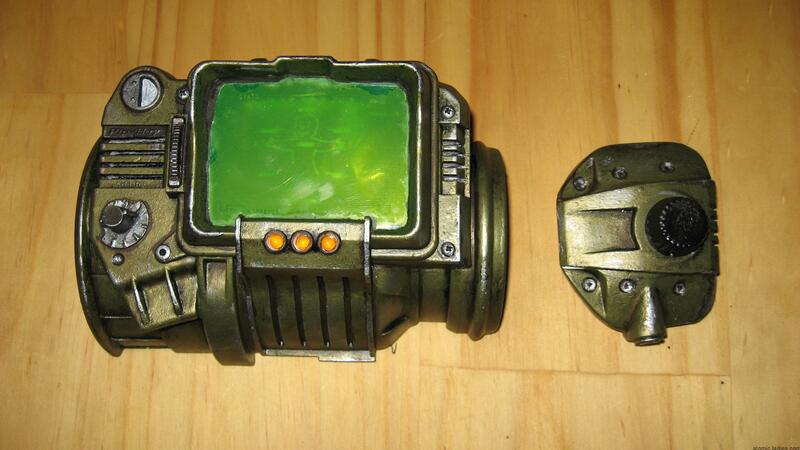 There are many Pip Boy 3000 replicas that people have made. What’s unique about this one? 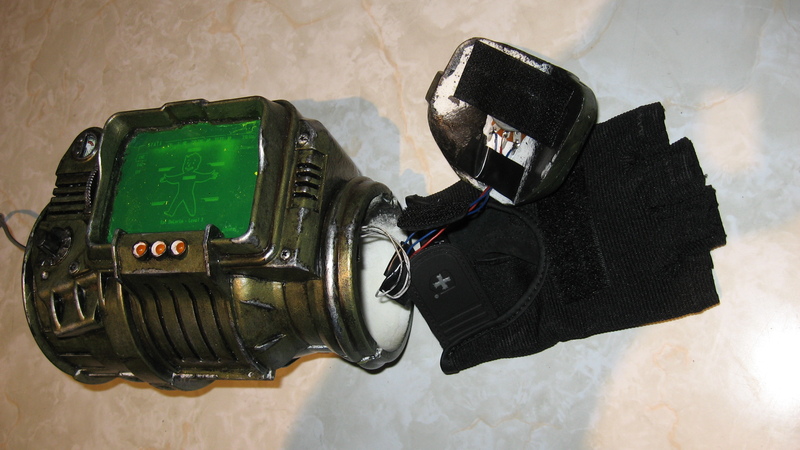 Many people have made their own versions of the Pip Boy 3000 to wear with their Fallout vault jumpsuits. Some are very simple, while others have gone all-out and in put Raspberry Pi programmed screens. I wanted to make something that was as close to the game model as possible, but also easy to wear and included all the light and sound effects. This Pip Boy 3000 build has selectable, light-up STATS, ITEMS and DATA buttons (with sound effects), green backlit display, and in-built amplifier with volume control that can be connected to an MP3 player to play all the Fallout music, or any other music you like. I used the fantastic Pip Boy resin cast produced by Skruffy Studios, which was topped off with an awesome paint-job by Sean Kelly. 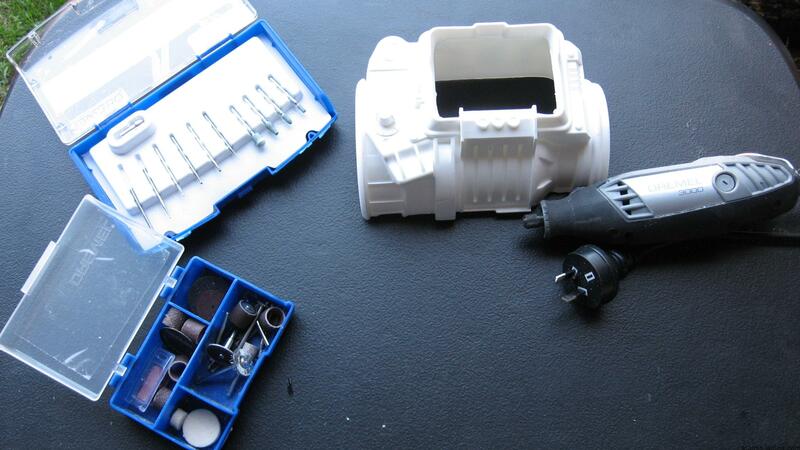 Repair skill 70 – A steady hand is needed to put together a lot of small and fiddly electronic components. Science skill 50 – some knowledge about electronic circuits and components is useful, and basic soldering skills are required. The first step involved Dremelling. Lots and lots of Dremelling. The Skruffy Studios Pip Boy cast that I’ve used is fantastically accurate, but there is parts that need removing so you can wear it on your wrist. Several cubic centimetres of plastic needed to be removed from the inside of the cast so I could add the screen and electronics. I used a variety of drill bits including engraving cutters, drill cutters and sanding discs. As well as evening out the edges so the back and front parts fit together, I also cut out holes for the three orange lights, slots on the left and right that the speakers will sit behind, and I trimmed out the display hole so the screen would fit cleanly. I also cut off the dial knob on the left hand side and drilled a hole through the cast so I could install a rotary switch to make the selectable STATS, ITEMS and DATA orange lights. More Dremelling was required to cut out a hole in the handpiece to hold a 10K Variable Potentiometer. The potentiometer was used as the volume control for the music with the connecting wires put through the glove and into the main pipboy body. Tip: Make sure you wear protective gear when Dremelling unless you want to be coughing up white plastic flakes. It covers everything and gets everywhere. Dremelling all finished. On the handpiece I actually cut out more than I needed to. It only needed to be a 1 cm hole not a 1 inch hole. From behind. 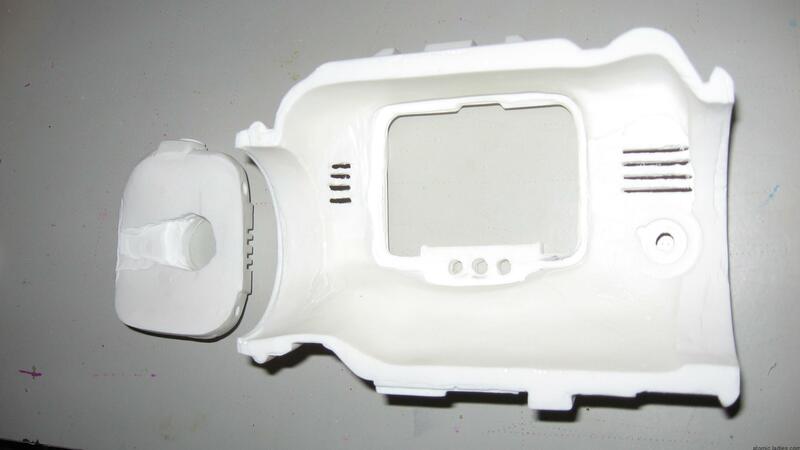 Note the tapered section cut out on the handpiece, and the circle cut-out pattern where the rotary switch will be placed. Two sheets of green cellophane. 12-way, 3 pole sealed PCB Rotary switch. Adjusted to a 4-way switch. Pip Boy stats screen image. Screen-cap from Fallout 3, resized and converted to monochrome using Photoshop, and printed onto an overhead projector transparent sheet. Small piece of circuit board, about 10mm x 40mm. 1x resistor. The recommended resistance for the LEDs I used is 360 ohm (orange blue brown). The closest I had was 330 ohm (orange orange brown). 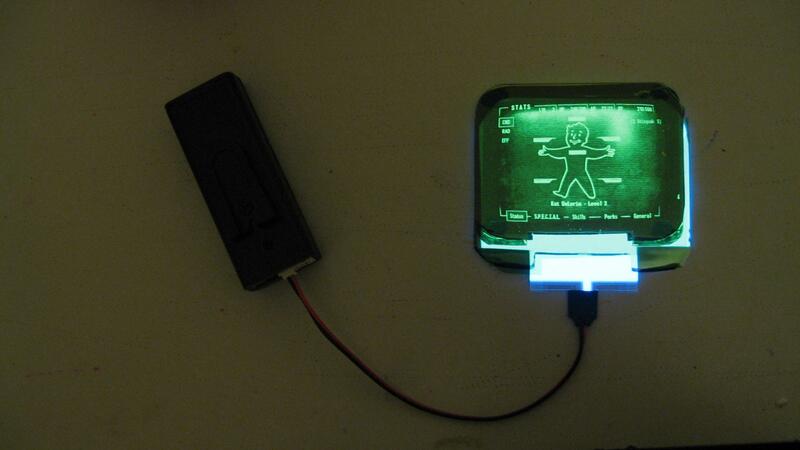 To make the light-up display I glued the Status screen transparent sheet onto the fluro green acrylic sheet and slotted them into the Pip Boy display hole. The acrylic sheets were a custom order from Ponoko, laser cut to the correct dimensions. Despite my best efforts to get the laser cutting done as accurately as I could, I still had to get out the Dremel again and trim the acrylic sheet down so it fit into the display hole. You can see what this looks like below (top). The display was backlit using the EL panel, cut to size, with the two sheets of cellophane taped over the top. The cellophane was needed because even though the acrylic sheet was a nice fluro green under normal light, with the bright white/blue EL panel behind it looked yellow. The two sheets of cellophane were needed to get an accurate green Pipboy colour, shown in the picture below (bottom). To make the orange lights, I covered the 3 light holes with the circuit board piece and poked the lights through, then wired them up in parallel. This was probably the most fiddly part of the whole project; trying solder small insulated wire lengths onto the LED conductor wires and making sure that they were all level and centred when they would be viewed from the outside. The photo below shows the three LEDs wired up and connected to the resistor at the (+) end, with each of the LEDs connected to the rotary switch at the (-) end. It’s easier to explain with a circuit diagram which I’ll put at the end of Step 3. The rotary switch was trimmed down and poked through the hole on the left side of the cast, and then the switch knob that I cut off earlier was glued back onto it. Not only does this Pip Boy 3000 build have pretty lights, it also makes the same electronic buzzing noise that you hear in the game as you select between the orange lights, and it plays any of the music from the Bethesda Fallout games. For this you will need. 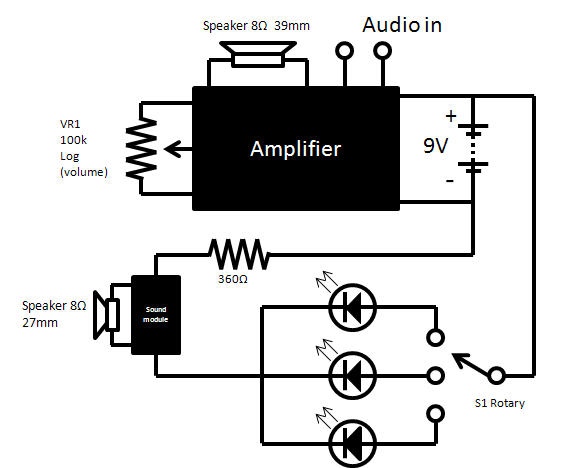 A small amplifier with volume control. 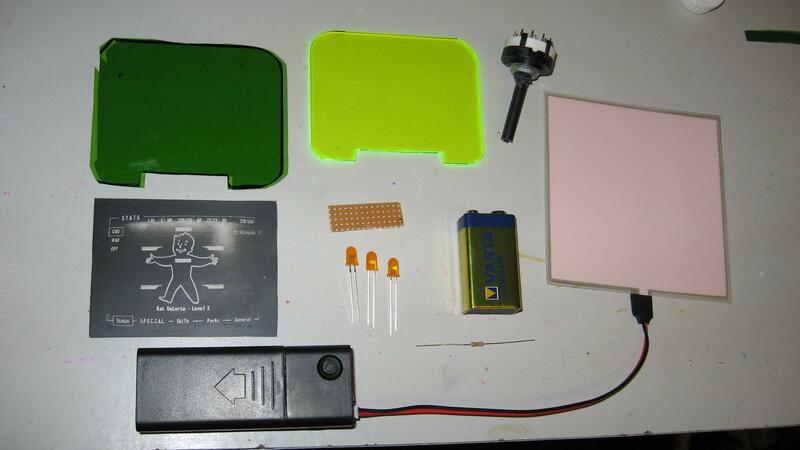 I bought a DIY project kit from Jaycar, an Australian electronics retailer, and put it all together. Sound module from a recordable greeting card. I bought a few push-button modules from www.invitebyvoice.com. Cheap stereo earphones. Cut the earbuds off, you only need the wires and the connector jack. Small MP3 player. An iPod touch is ideal. I extracted the file sound\fx\ui\pipboy\static\ui_static_d_05.wav from Fallout – sounds.bsa, increased the volume using sound editing software, and transferred it to the sound module using the Invitebyvoice USB software. The sound module will now play the buzzing noise everytime the circuit is completed. To get this to function with the rest of the pipboy I cut off the push-button switch and connected the two loose wires into the lighting circuit. Now, whenever you turn the rotary switch to change the orange lights, it will also buzz. The amplifier came with a larger 57mm speaker, but this was too big so I transferred the flat 39mm speaker from the sound module to the amplifier. I then connected a 27mm 0.25W 8 ohm mylar speaker to the sound module. After a bit more dremelling these two sizes of speaker fit really well into the inside of the Pipboy. You can see in the picture below how I arranged all the electronic components. First, I got a clear acrylic sheet and cut it out into a shape that covered most of the inside of the pipboy (more dremelling). This acrylic sheet was important because it supported the amplifier, kept the EL panel in place underneath it, and gave me somewhere to secure the resistor. The large speaker slotted slightly underneath the rotary switch and was also stuck to a black mesh square that I got in Skruffy’s Pipboy pack. 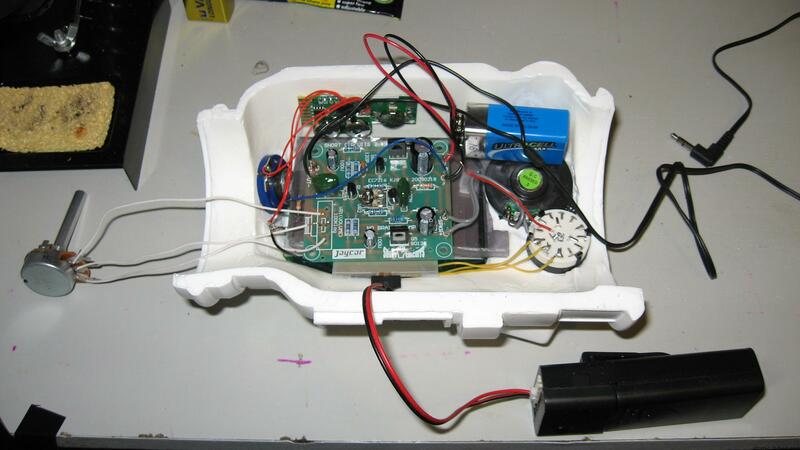 The sound module was glued to the top, and the smaller speaker was glued to the side, covering the slots. The variable potentiometer that serves as the volume control was removed from the amplifier circuit board and connected via three wires, because I wanted the volume control to be on the glove. The headphone wires were soldered to the amp input pegs. Re-wiring a stereo headphone wire like this is painfully fiddly and requires a lot of patience and trial-and-error. With this step finished all the electronics is done and all that is needed is to make it wearable. There are 10 different static noises that sound in the game when you click through the Pipboy menus. Unfortunately using this type of sound module you can only use one. I chose the d_05 wav file. The sound module has its own 4.5V power supply, but because it is also connected to the 9V battery, there will occasionally be a short feedback squeal instead of the buzzing noise, This happens less frequently as the 9V battery loses charge. The battery pack from the EL panel emits a quiet but high pitched tone when the panel is lit. Most of the time you wont notice but it sometimes can be quite audible. I don’t know how to get rid of it but turning the variable potentiometer at either 100% or 0% seems to help. The 39mm speaker that came with the sound module sounds pretty good when everything is enclosed, but it only has a plastic diaphragm. After two days at PAXAUS, plus all the testing beforehand, the speaker packed it in and needed to be replaced. The two halves of the Skruffy studio Pip Boy cast don’t fit together without leaving some gaps, so i remedied this by cutting out a piece of acrylic sheet that followed the outside shape of the model that would close up the holes. This also gave me somewhere to hide the hinge and not have it stuck to the outside looking ugly. Any rough edges that were left I smoothed over with the epoxy filler. Superglue was good enough to stick the acrylic sheet to the Pip Boy. 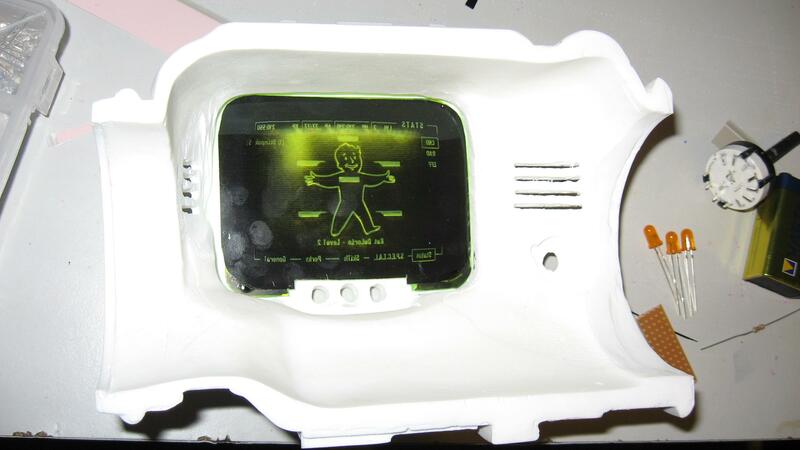 The second most fiddly thing in this build was screwing in the hinge so that it all lined up when the Pipboy closed. I also had to cut a groove into the acrylic sheet to that it sat flush when closed. You can also see on the picture that I put two rare-earth magnets in each half which helped it stay shut. This method was effective but only if (like me) you have thin arms and wrists. I better method that I used for day 2 of PAX Aus was to just drill two small holes in each half, thread a wire tie through it and twist the two ends together. I protected all the electronics from dust and sweat by covering it all in tape. Ironically, this actually made it sweatier to wear. We will be updating this to be something more comfortable. Turning it from a hunk of clean white plastic to a beat-up, weathered, post-apocalyptic metal arm band was the work of Sean Kelly, so I don’t have any comments or instructions about how to do the paint work, but it looked totally awesome. I went over it with a double-coat of Mod Podge afterwards to seal it and prevent the paint chipping. We hope to publish some painting tutorials in the future. If you have any questions, you can post them in the comments. 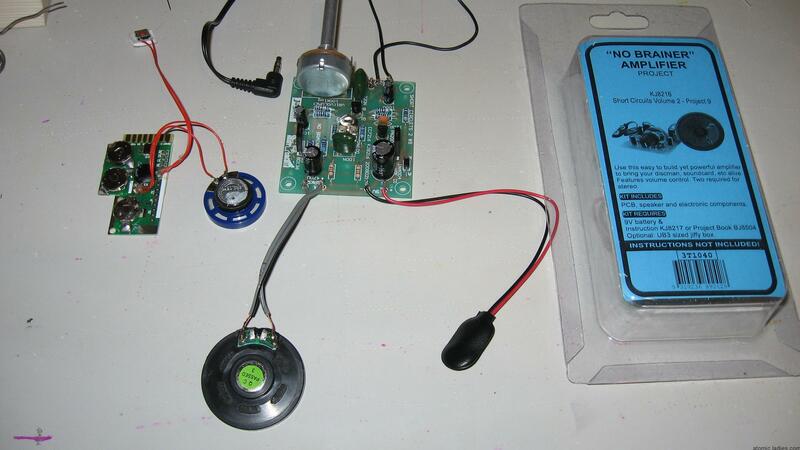 The picture below shows how I made the glove and handpiece with the volume control. I bought a weightlifting glove (one that was mostly black and had a velcro tab) and then stuck some adhesive velcro to the glove and the underside of the handpiece. The variable potentiometer shaft was trimmed down, either with a hacksaw or metal cutting dremel bit, and placed into the resin handpiece. The dial knob was glued on the other side. 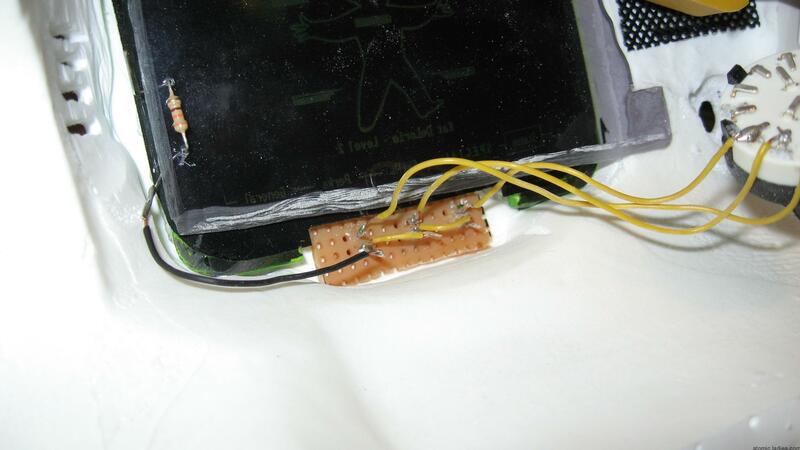 Having the velcro tab meant that could feed the wires through easily and then cover them up. The Finished Pipboy. Just stick the handpiece to the glove and hide the wires under the tab. Here is a short video of it all working. I’m holding the MP3 player in my left hand and clicking through random tracks that I extracted from the GNR and Enclave Radio audio files. The cord you can see behind is just the headphone cable. So that is that. I added some foam padding to the inside so it didn’t roll around on my arm, but this depends on your individual arm size and shape. 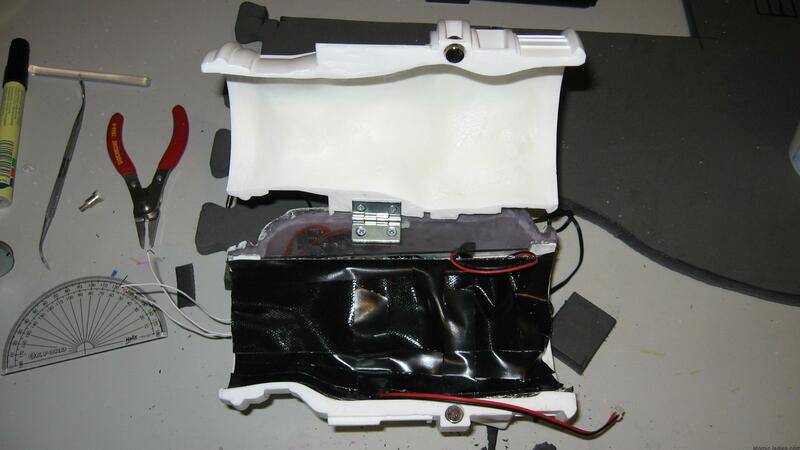 The MP3 player and the battery pack were stuffed into my upper arm sleeve, which also required the battery pack wires to be extended. I imagine that that a real Pipboy 3000 is made of metal and glass and therefore is fairly heavy. Holding and aiming a Sniper Rifle would get very tiring. Wearing this resin Pipboy was a little bit awkward. It’s not very heavy so your arm won’t get tired, but it is bulky and encloses most of your left forearm. I’ve never broken an arm but I imagine that it’s like wearing a very think plaster cast, but if you were wearing a real Pipboy 3000 you probably would have an automatic 20 point handicap to Lockpick and Repair. Still, I was able to eat lunch, take photos, test the New Nintendo DS and play the Super Smash Bros. and Sunset Overdrive demos on WiiU and Xbox One, and it probably gave me about +3 to Charisma as heaps of people wanted to check it out and get a picture. Electronics can be pretty fiddly, especially when you’re limited to the space inside a Pip Boy 3000, if you have any questions feel free to post them in the comments section below. Also, with any prop building project, there’s room for improvement. If you have any tips or suggestions, we would love to hear about them too. But for now, that’s allllll children. First off I love this prop! I’m working on making a similar one that fits my phone. But how did you get it to fit in your arm? From what it sounds like you figured out how to get it on snug where it doesn’t want to fall off. Any suggestions? The cast from Skruffy Studios that I used will cover most of your left forearm, and has a diametre of about 4 inches. The maximum forearm circumference that it would easily fit is about 12 inches. My arm is smaller than that so I lined the cuff with some padding made from strips of EVA foam that snuggly fit on my wrist and stopped it rolling around. Because it’s quite top-heavy, it needs to fit around your wrist very firmly, otherwise it will roll around on your arm. Good luck with the build that fits your phone. It might need to be a bit longer than this model, but it should cut down on weight and all the annoying wiring. They’re fairly power-efficient, too; the one I’ve used can keep a string of 240 NeoPixels running at full power, with a constant lightsaber hum, for over an hour on a single 18650 battery – so my guess is that it could keep a Pip-Boy with three LEDs running all day (not sure how much the EL panel would cut the runtime, though).